How should I dress for the flight? Will it be cold? It is a good idea to dress according to the weather conditions in freetime clothing which are comfortable to move in. 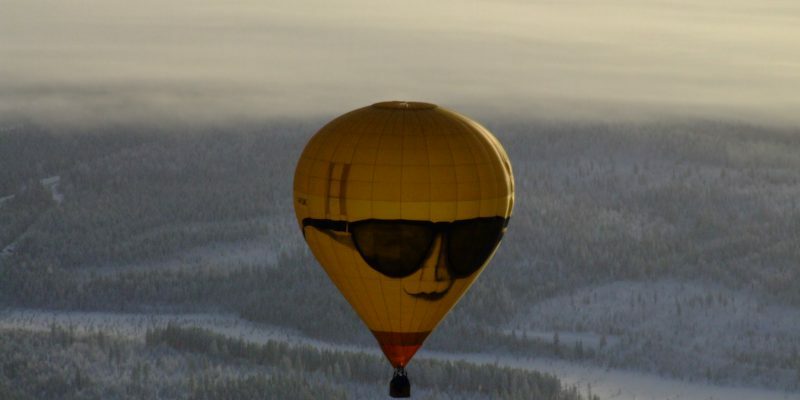 The altitude we fly in is not colder than on the ground, because the balloon moves with the wind it does not feel cold in the basket. It is a good idea to wear sneakers or other comfortable shoes. Can I use my mobile phone in the balloon? The avation laws forbid the use of mobile phones in flying vessels, including hot-air balloons. The mobile phone has to be shut during flight. The phones may be switched on after landing. Yes! You may freely photograph from the air. Remember to take your camera, video camera and binoculars with you. In what weather do we fly? It is possible to fly with a hot-air balloon only in good weather. The flight can be prevented by rough or turbulent winds (over 5 m/s), rain or poor visibility. When we meet for the flight, it is confirmed beforehand that the weather is favorable for flight. The preparations for flight can usually begin immediately upon arriving at the take-off site. Occasionally we have to wait for the winds to calm before take-off. How fast do hot-air balloons fly ? The flight speed is the same as the wind speed. If the speed of the wind exceeds 5 m/s, the balloon usually cannot be filled. This is also the wind limit of our flights. How high does the hot-air balloon fly? Hot-air balloon flight is most enjoyable when it takes place at an altitude of 150-400 meters. When hot-air balloons fly over habitated areas, they fly at least 300 meters above ground. There are no limits to flying higher. Specially made balloons have flown up to 16 km altitudes. How long do the balloons fly ? Passenger flights with a hot-air balloon take about one hour. It is possible to fly for longer periods of time. The flight time depends on the temperature, weight aboard and fuel. How do you navigate a hot-air balloon ? The balloon moves in the same direction and speed as the wind. The pilot uses his skills to determine the altitude where the best possible winds are. Winds blow in different directions on the ground than in the air. The altitude is regulated using a burner, which heats up the air inside the balloon. When the burner is on, the balloon rises higher. Otherwise the balloon air slowly cools and the balloon descends. When the hot-air balloon has risen to the sky, the ground crew follows it by car. The ground crew will try to reach as near as possible to the landing site by using maps, sight and radio contact. The ground crew assists the pilot in emptying the balloon and putting the equipment together and transporting the passengers and equipment back to the meeting place.